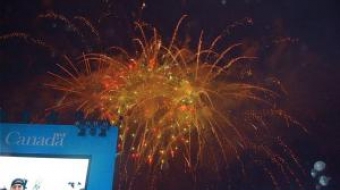 What we saw at the Closing Ceremony of the 2010 Games was very different than what we saw in the Opening Ceremony. In retrospect, the Opening Ceremonies seem overwrought. Tonight, on the other hand seemed as light as the atmosphere in the streets of Vancouver were after Canada took the gold medal in hockey today---maybe too light. We saw Neil Young, Avril Lavigne, Nickelback and Alanis Morissette perform. We heard an orchestra and saw ballet from Sochi, Russia, a city of 400,000 and the site of the 2014 Winter Games. The performance was inspiring and conveyed historical and cultural refinement and sophistication that was utterly lacking in the rest of the programme. Five Olympic champions, a World champion hockey star, a top supermodel, a world-class soprano, a globally revered conductor, children and ‘Zorbs’ – giant spheres like snow globes, maneuvered by performers inside were part of the show that marked the Olympic Flag Handover to Sochi. For the first time in an Olympic Handover ceremony, digital technologies connected the audience in Vancouver to Sochi and the Russian capital, Moscow, sharing the celebratory atmosphere across time and space. At the end of the ceremony, the crowd simultaneously held up red, white and blue twinkling snow globes, representing the Russian colours, and demonstrating Sochi 2014’s intention to involve people from all cultures and backgrounds. 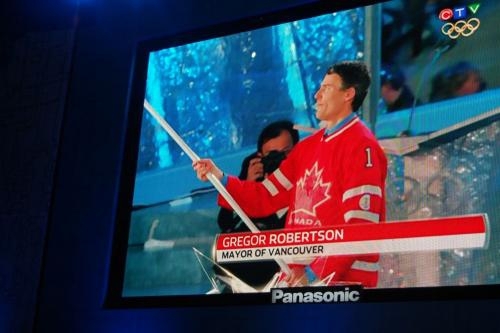 Moments before the show, Mayor Gregor Robertson handed the Mayor of Sochi, Anatoly Pakhomov the Olympic Flag in front of a capacity crowd and thousands of winter sports athletes from around the world. This officially marked the moment when Sochi became the Host City for the next Olympic Winter Games. We heard a stodgy John Furlong murder the French language, but at least we heard him speak it. There was still a noticeable lack of Asians represented in the Closing Ceremonies, but there was a great deal more representation by the French. There were no First Nations performers, but there was a goofy, floating Moose and there were giant Canadian Mounties with bobbling heads. I'm not sure how to interpret that. As usual, there were beautiful women showing lots of skin and some mediocre spoken word performances by guys who were chosen for reasons you have to wonder about. But, whatever. It was an apt closing to an event that infused the streets of Vancouver with celebration over a gold medal in men's hockey. Canada owned the podium, people were saying, when it came to gold medals--- and all of Canada was celebrating it seemed. There were many ways to view the Closing Ceremonies. Inside BC Place, tickets went for more than a thousand dollars. I was watching the Closing Ceremonies on the huge screen outside at the Vancouver LiveCity site at David Lam Park. 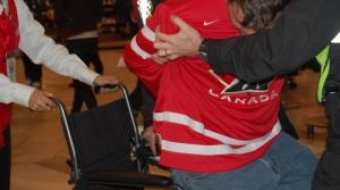 When the ceremonies started, I wrote a friend who was watching the ceremonies live in BC Place: "Brilliant. So funny!" Then came the dancers with snowboards and the song about Vancouver. "Whao-oooo Van cooo ver." The huge crowd at LiveCity were getting into the Vancouver song bigtime, but a commercial break cut it off. I wrote my friend at BC Place: "F**king commercials!" "So cool inside. No commercials," he pinged. "We the people are enjoying it, too," I pinged back. "But they're selling us stuff. Need a Big Mac?" "We, the elite, are gaining about one degree of body heat per minute in our white ponchos," he answered. "While we the people are cooling our asses on the sweet Vancouver ground." My phone died at that point, and I settled in and enjoyed the show. When John Furlong announced the Games were closed, a collective: "Nooooooo...." went through the crowd. The lights from the caldron went out. Another commercial break. Afterwards, the CTV announcers said it was time for a concert. BC Place rocked out. I started home with my boys.